When I was little I read A girl and five brave horses -- the story of the Atlantic City diving horses that started in the early 20th century and ended in the seventies. Yes, the photos of those tiny figures plummeting into a water tub was poignant and moving for an 8 year old horse lover. By golly that IS brave, whether you think it's a advisable or not. And, by the way-- it's. not. advisable. Even to my child's imagination--an imagination that welcomes the horse as the center of almost any activity--this seemed like a bizarre and pointless sort of entertainment. Yep. The best part about that book was the title. I don't know what to make of the girl riders either. THEY got hurt alot, even if their horses didn't. The riders swore the horses loved their job, and you can hardly prove otherwise from the videos. There was a movie on the subject, Wild Hearts Can't Be Broken, which unlike the book is a crappy title. Has anyone seen it? 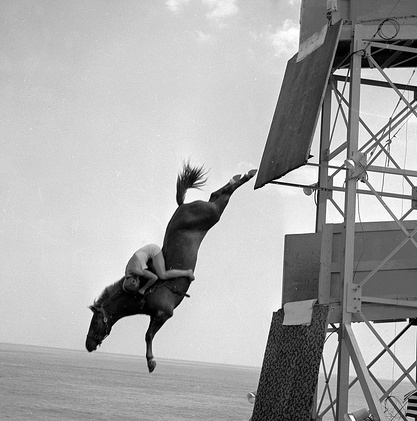 I saw the diving horses at the Steel Pier many many times when I was young. I cannot tell whether or not the horses actually "liked" it or not, but they didn't need much encouragement to do it. They were stabled inside the pier and in between shows you could visit them. No touching, but back then, for me, just being within 5 feet of a real horse was a thrill. This is one of the weirdest things I've ever seen a horse do, why would people want to make them do that in the first place?! Wild Hearts Can't be Broken is fantastic. I love that movie! I really enjoy reading your blog but have to say I didnt enjoy this video, I cant see anything which would make me believe the horses enjoyed their jobs, they were probably petrified. I saw the movie. It was ok.... I just don't like the whole idea of this as entertainment. I can't see a horse really loving to do this. I've seen the "Wild Hearts Can't Be Broken" movie...it was actually a pretty good film, more about the girl than it was about the actual horses but it was still entertaining. I believe they actually did real dives for the movie but I could be wrong. 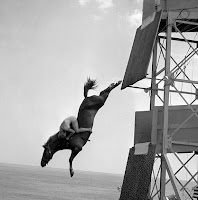 It amazes me that those horses would jump from those diving boards like that!! Yes. I've seen the movie. Loved it as a kid. Now I'll need to see if I can find the book to read... never knew there was a book out there about the "diving horses". My mom and dad took me to see a diving horse at Lake Compounce in Bristol, Connecticut when I was about four. The horse HATED it, so much so that I still vividly remember it more than 60 years later. My mom was horrified too. I guess she had "bought" the idea that the horses like it. The horse is this video doesn't seem too thrilled either, and only jumps when it no longer has an option. Yikes! I have seen Wild Hearts can't be Broken, and its actually a really good movie! I recommend it! I saw that movie years ago. I don't remember much about the movie beyond the diving horses. The images have stayed with me, and I always wondered if they were real horses, or if it was a trick somehow. That's amazing that it was real. Wow. My sister and I LOVED that movie when we were kids. We watched it a million times, but I never heard of that book! I saw the movie then found the book. i'm still not convinced the hoirses loved it. I think it has a lot to do with how easy-going horses are, and how far we can push them, especially if they want to please us. The photos of them jumping through the air are graceful and inspiring. The video footage is barbaric. I've had 3 mares who loved water jumps and swimming in creeks and dams. I live close to Atlantic City, so the diving horses are a very well-known part of our local history. I never saw them as a kid, but I did watch the movie many times and really enjoyed the spirit of the girl and her horse. "Wild Hearts Can't Be Broken" was based on true story. The real heroine of the story passed away several years ago. She was well into her nineties. Wild Hearts Can't Be Broken is based on the true story of Senora Webster. I just posted about this on my other blog, with some original footage from her. Her relative was commenting on You Tube that Senora always said, there were horses that did not want to do it and they were always sent on for another career, she said the last thing you would want to be on is a diving horse who does not want to dive. Really interesting videos, I personally love the diving horses. I saw that movie a few years ago and watched it because it was about horses. I appreciated and enojyed watching the horses, but was appauled by what they were doing with them. Hi! I'm new here. Love the blog! I have never seen anything like this. I can't believe those horses willingly jumped from that height. They are FAR more brave than I am! How do you think they train the horses to take the leap? Surely the horses don't reeaalllyy want to dive? I saw the movie. The story was good, but I think it's incredibly dangerous and stupid to do that to a horse. Poor things. I've never seen the footage you posted. There wasn't anyone behind him at the top of the ramp pushing him and she wasn't hitting him with a whip or anything . . . it looked like she just waited on him to decide to jump . . . I wonder what kind and how much training went into that. Wasn't it a lot higher in the movie? I hope they aren't still doing this . . . I was thinking about these diving horses today, and realized I have 2 horses (by the same stallion) that almost certainly would quite willingly dive. Neither one has an ounce of self-preservation, which can be kind of fun but also a big responsibility in day-to-day life. Anyway, perhaps some horses were like these two of mine, and really did like diving? There was a fiction book by Patsey Gray titled _The Diving Horse_ about a family of circus/carnival performers that had a diving horse. It was set in the '50's. "(apuppet)Created for Disney's "Wild Hearts Can't Be Broken." When a shot was needed of a horse leaping forty feet and the ASPCA said "no way" to a real horse doing the stunt, this puppet was commissioned. "There are three horse diving scenes in the picture. In this picture as in all other pictures, there were doubles trained for the picture. Six horses in all were in Wild Hearts Can't Be Broken. Four were trained to dive. While the real Sonora's horses dove forty feet, the horses that made the picture never dove over ten feet, which is the maximum that American Humane Association's Guildelines will allow. American Humane was on the compound for the full training period. .. The horses were chosen very carefully and only horses that liked the water were used. Training was done very slowly by first seeing if the horses liked to swim. They were allowed initially to swim in the tank made for the picture. As training progressed, they were allowed to step off one foot into water, then two feet and so on until they had reached the ten foot maximum. The horses always jumped on their own. In order to achieve the forty foot height, a lot of Hollywood magic was used. .. Then a mechanical person on a mechanical horse, ..., made the jump appear to be forty feet. The jump is shown in cuts with only leaving the board and entering the water being the real horse jumps. American Humane is generally opposed to equine diving acts so initially attempted to persuade the production company not to make the picture. However, our authority does not go beyond making sure that the animals are protected. We soon became aware of the company's total commitment to the safety of the horses. Caution and time was taken to choose the right horses and train them. Pegasus Productions conferred with American Humane throughout training, pre-production and production. There were no horses injured during the dive in either training or production and the horses seemed to be enjoying what they were doing. (The tank at the compound had to be blocked off when not in use because the horses and dogs on the ranch would run up and jump off on their own when there was no training being done.) All the other animal action was mild and achieved with hand signals. Not only was American Humane on the compound during all training, but was on the set everyday that animal action was being shot in California. John Freed, Director of the Greenville Humane Society, represented American Humane on the set during that portion the picture shot in South Carolina. Because of the way that the production company worked with American Humane and because of the precautions taken to protect the horses.